State government annual reports season ended up hitting late this year due to the election. It’s usually in September, but this year everything got tabled in Parliament late on Wednesday. Here are some things I noticed during a quick skim. 20.8 million trips, up about 1.5 million in a year. No wonder the trains are crowded. All of the increase is on rail; coach trips are slightly down to 1.3 million, and account for only about 6% of all trips. They sold 2 million paper tickets (used for coaches and trains outside the Myki area), so that might mean that around 90% of V/Line trips are on Myki, though some paper tickets would presumably cover multiple (eg return) trips. Compensation paid doubled to $157K – and that’s “compulsory compensation”, so presumably not voluntarily, but related to ongoing (worsening?) poor performance. Regional trips 33.3 million for 1.5 million = 22.2 trips per person per year; perhaps no surprise that it’s lower, but it makes me think a lot more needs to be done to improve regional town services, where public transport can compete more against car trips. Payments to operators of $1.4b to MTM (Metro), $0.3b to KDR (Yarra Trams), $2b for the dodgy state government Capital Assets Charge for rail infrastructure (there’s no equivalent road charge) and $1b for bus services. Nothing in the reports leapt out at me as a gotcha reveal, but things are so busy that I’ve only had time to skim. And among the other 115 reports released on Wednesday, the VicTrack report is also out… I haven’t read that yet. Anybody else spot anything interesting? Which has more trains? 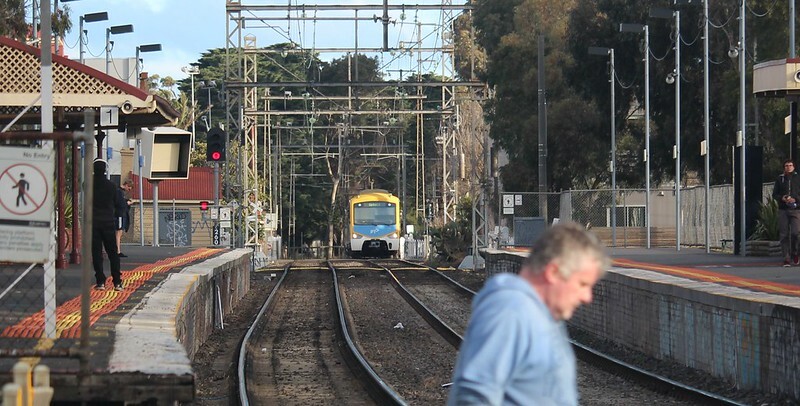 The Upfield line or the Geelong line? They’re quite different rail lines. The Upfield line serves Melbourne’s northern suburbs, and runs via the City Loop. It runs electric Metro services through 16 stations (plus 3 City Loop stations). The route is 23km long, and takes about 36 minutes. 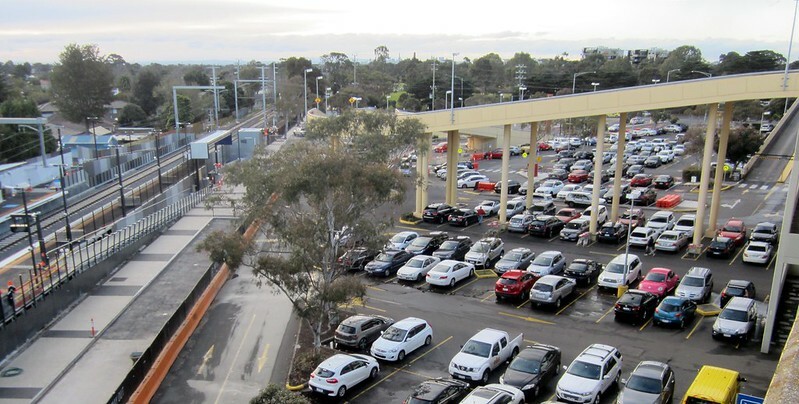 The Geelong line serves Melbourne’s outer-western growth suburbs at Wyndham Vale and Tarneit (along with Deer Park, also on the Ballarat line) as well as the city and suburbs of Geelong, all the way out to Waurn Ponds. It runs diesel V/Line services. It’s about 93km to Waurn Ponds via Regional Rail Link, also with 16 stations, taking about 75 minutes. And the answer to the question? If I’ve got my numbers right, overall the Upfield line has more services each week: 749 vs 714. But the Geelong line has more on weekdays (122 vs 108), and has a lot more services during peak. While the Upfield line peak is only three trains per hour (every 18-20 minutes), the Geelong line is more intensive, with 8 trains arriving at Southern Cross between 7:30 and 8:30am (some originating at Wyndham Vale). The Geelong line is more tidal. Counting peak as before 9am, and 3pm-7pm, there are six more trains in the peak direction than counter-peak, meaning V/Line has to find central city stabling for those trains during the day. The Upfield line is balanced, partly because the peak service is basically no more frequent than off-peak. 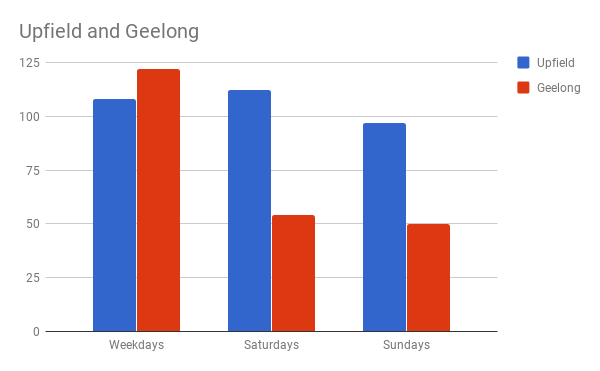 On weekends there’s no contest: the Upfield line runs every 20 minutes for most of the day, with the Geelong line at half that frequency — woefully inadequate for a train line serving suburban areas. There are more trains in the evenings on the Upfield line, half-hourly, but not by much, as the Geelong line runs about every 40 minutes. Monday to Thursday nights, the Geelong line has a last train that’s far later than any Metro line: departing Southern Cross at 1:15am. On the Upfield line, stopping patterns are fairly simple. Between North Melbourne and Upfield every train stops at every station. There’s a myriad of stopping patterns on the Geelong line, at least on weekdays. Firstly, trains originate and terminate at: Waurn Ponds, Marshall, South Geelong, Geelong and Wyndham Vale, as well as a few running to/from Warrnambool — combined with varying platforms at Southern Cross, this leads to confusion for passengers at the Melbourne end looking for their next train. Unless I’ve miscounted, that’s 16 different stopping patterns in just the first 22 trains to Melbourne on a weekday. Amazing. It must confuse the drivers no end. With all these variations, plus the line sharing tracks from Deer Park in with the Ballarat trains, and Bendigo trains from Sunshine in, it’s no wonder the punctuality is a mess. For it to work, every train would have to be right on time, every time… which they aren’t, because regional train designs are really slow for loading the large numbers of passengers who use these services. 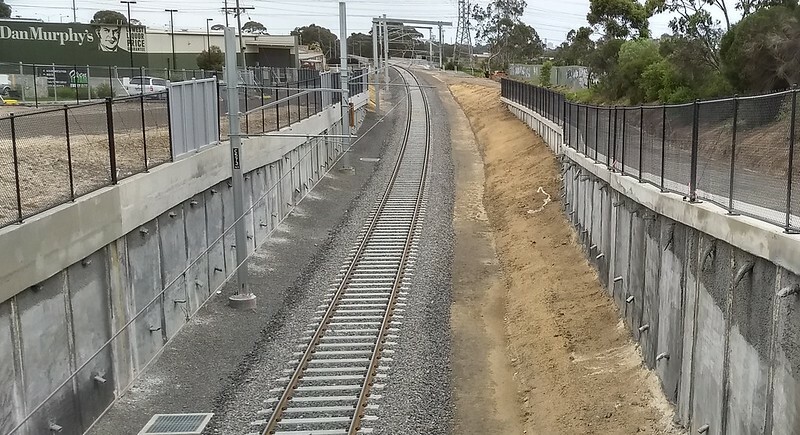 The Geelong line has single track at the outer end, for most of the way from Geelong to Waurn Ponds, though this is set to be duplicated soon. For now though, it causes issues, including some counter-peak trains not stopping at Marshall because while there’s a passing loop, there’s no platform on it. The Upfield line’s single track is also a bottleneck. So you’d think it would be a priority to fix? But no — the recent Camp Road level crossing removal (costing around $85 million) made provision for it, but didn’t actually fix it. Despite this, it is actually possible to run more trains on the Upfield line, every 10 minutes as far as Coburg. How do we know this? Because it happened during the 2006 Commonwealth Games to better serve venues at Royal Park. These days there’d need to be some jumping through hoops at the city end, since the Northern Loop is full until the Metro tunnel is completed, but some trains direct into Southern Cross would be possible. 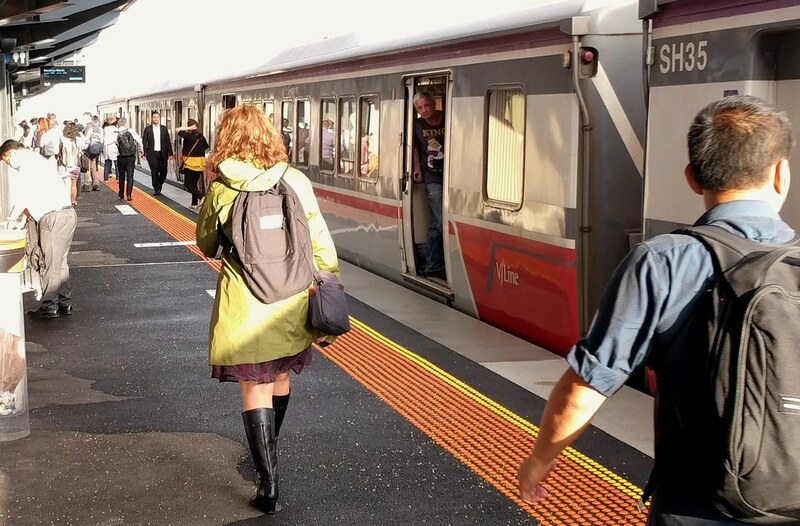 Regional Rail Link brought trains to Melbourne’s outer west, but brought with it the challenges of services for regional Victoria sharing with suburban travellers — something at which V/Line really hasn’t excelled. In the near future we’ll get an idea of what the State Government has planned for the regional rail network. Separating it from suburban services — giving Tarneit and Wyndham Vale a Metro service — has to be a priority. And hopefully the Upfield line (and all the other Metro lines) will get full duplication and frequent all-day services… in our growing city, this is nothing less than Melburnians need and should expect. Public transport compo: what is the threshold? If you’re confused about tram and train compensation thresholds, you’re not the only one. PTV CEO Jeroen Weimar said both Metro and Yarra Trams narrowly missed their new targets for punctuality in February, but met their targets for reliability. 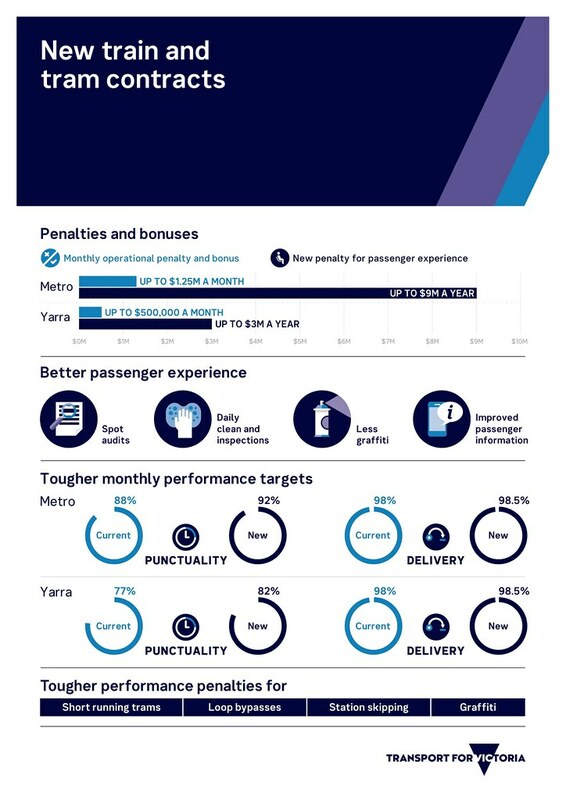 As shown in this Transport For Victoria info graphic, the performance targets changed in the new contract. 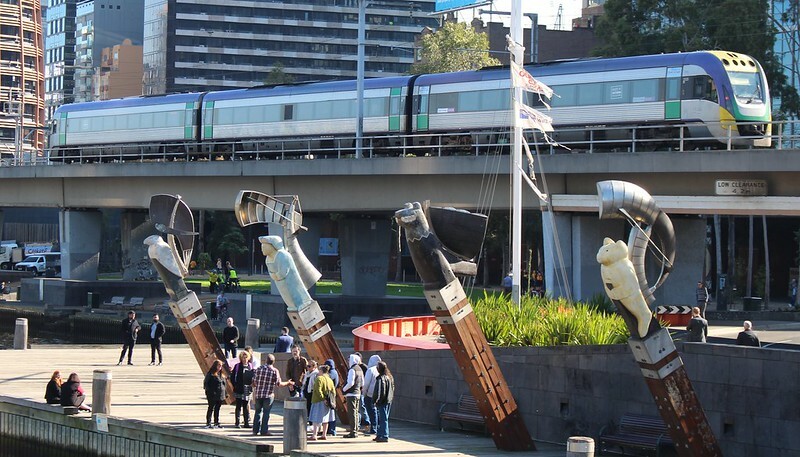 Okay, so if Metro and Yarra Trams missed their targets, can you claim compensation? It turns out no, you can’t. 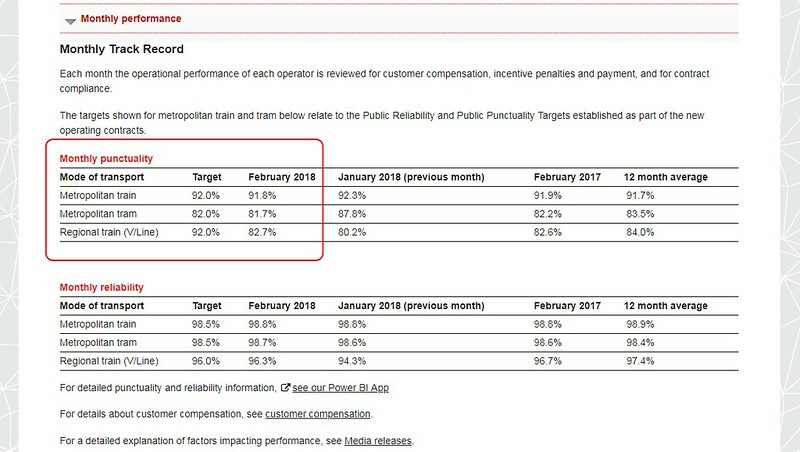 If you go looking on the Metro or Yarra Trams web sites, nowhere does it mention that compensation is payable for February. Why is this? I sought clarification from PTV. It turns out the target is different to the compensation threshold. It’s also apparently the thresholds, not the targets, that trigger financial penalties. So in this case, even though Metro and Yarra Trams missed their punctuality targets… the only consequence appears to have been a light public berating by PTV. There will be no more Altona Loop shuttles. Weekday Altona Loop services will run through to Flinders St. This also means Werribee trains will run express Newport-Footscray-North Melbourne, so both Altona and Werribee people win from this. Of course the mostly single track through Altona means bypasses are set to continue. At least we now know the Kororoit Creek Road grade separation will include some duplication. Hopefully that makes a difference. There hasn’t been a wholesale re-write of the timetable, so peak Williamstown and Altona services remain at every 22 minutes, while off-peak is 20! The Geelong line will go to every 40 minutes on weekends. With constant overcrowding on the current hourly trains, this was only a matter of time, though heaven knows why they didn’t push the upgrades a little further to half-hourly, which would have meant more trains, a clockface timetable (40’s alternating hours has always been problematic) and preserving the bus connections, many of which are every 30-60 minutes. As it is, bus connections will break. 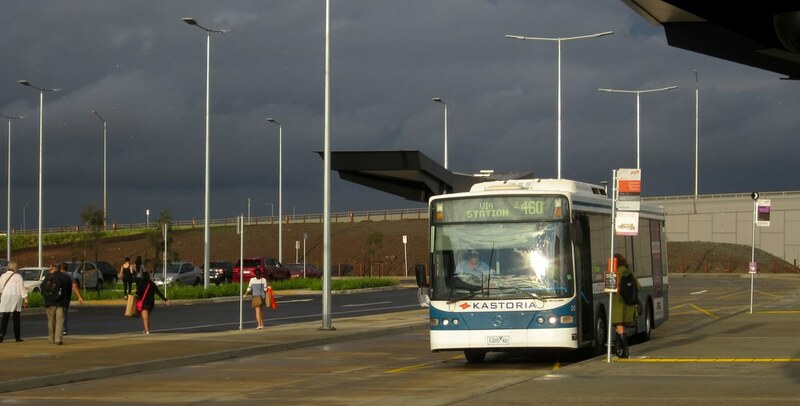 The premier Geelong bus service, route 1 from North Shore to Deakin, is every 30 minutes on weekends, and will remain so. It doesn’t take a genius to see that buses every 30 minutes don’t interface well with trains every 40 minutes. 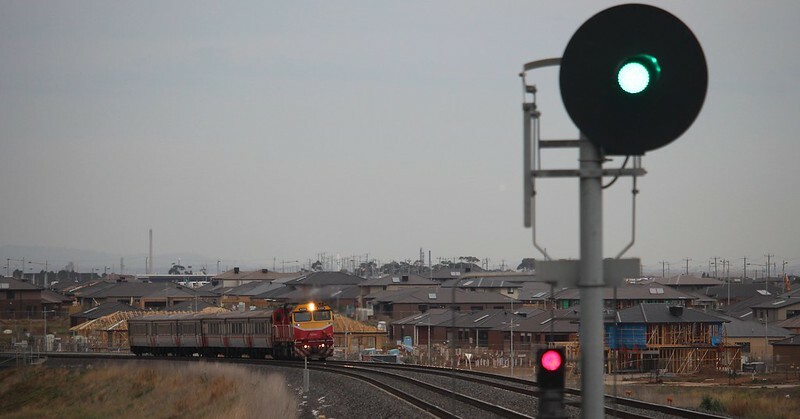 V/Line have said in response to queries that it’s because the Sunbury line is every 20-40 minutes on weekends, and the Bendigo line is tied in with that, because they share some tracks… and the Bendigo line in turn interfaces with the Ballarat and Geelong lines. 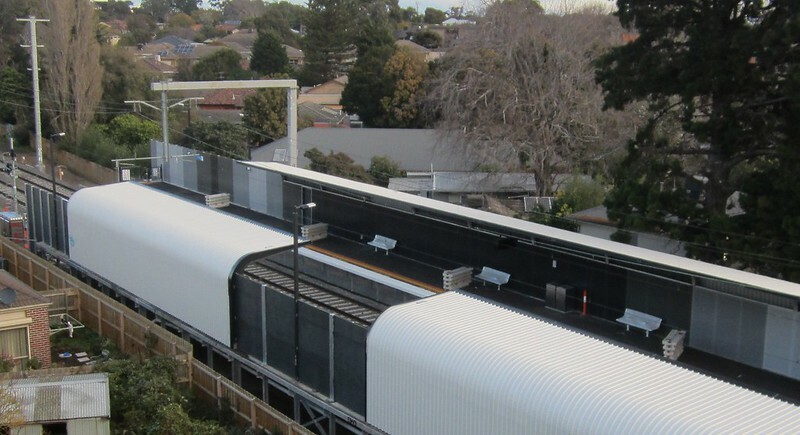 V/Line claims this prevents the Geelong line going to every 30 minutes. But then, this is the organisation that has three out of four hourly services currently meeting at Deer Park Junction within a few minutes of each other, so I don’t think it’s unfair to say that their timetabling leaves something to be desired. So if the inbound Geelong train is 3 minutes late, every second hour it’ll delay an inbound Ballarat train. If it’s even later, it’ll delay an outbound Ballarat train as well, thanks to the flat junction. 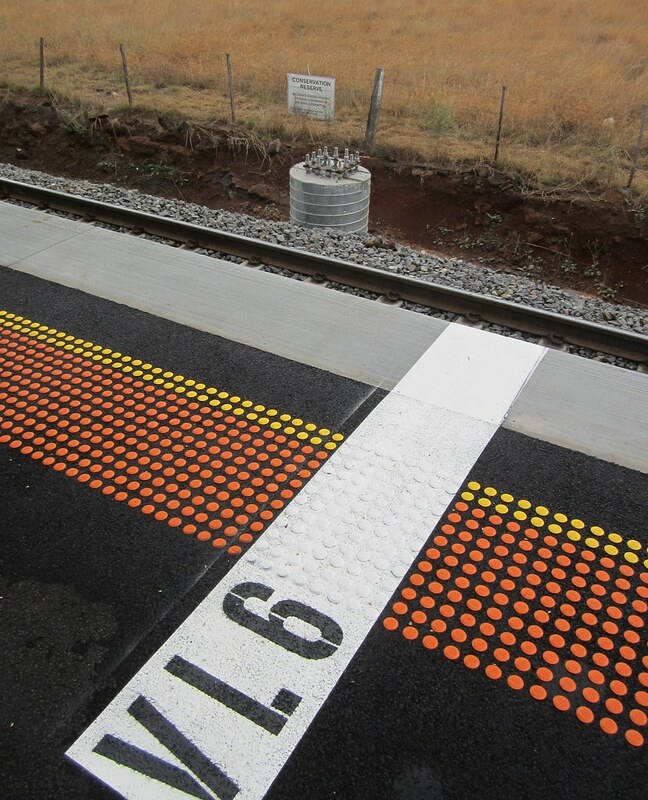 You’d think they could have figured out better spacing between the Geelong and Ballarat trains. Aside from junction conflicts, Deer Park passengers will have 2-3 trains per hour: either at 12, 15, 52 past the hour, or at 15 and 32. Hmmmmm. 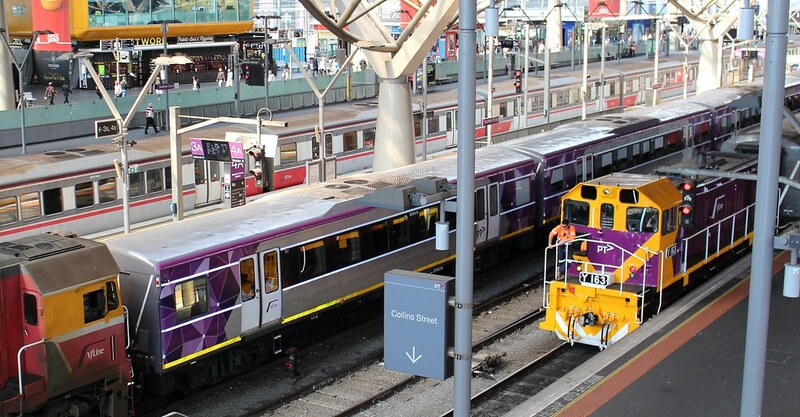 It remains to be seen whether V/Line continues to run their daily game of Mystery Platforms at Southern Cross. For those wondering about stopping patterns, the full timetable shows peak expresses will still run to/from Cheltenham, not stopping at Southland. On Sunday afternoon I went and had a quick look at the station. It’s looking good. These views from the top of the shopping centre carpark. The platforms are looking close to complete. Even some signage is now up. View looking towards the City. I’m guessing the structure closest the camera is the PSO pod and/or toilets. There seems to be plenty of coverage on the citybound platform; less so on the outbound platform. 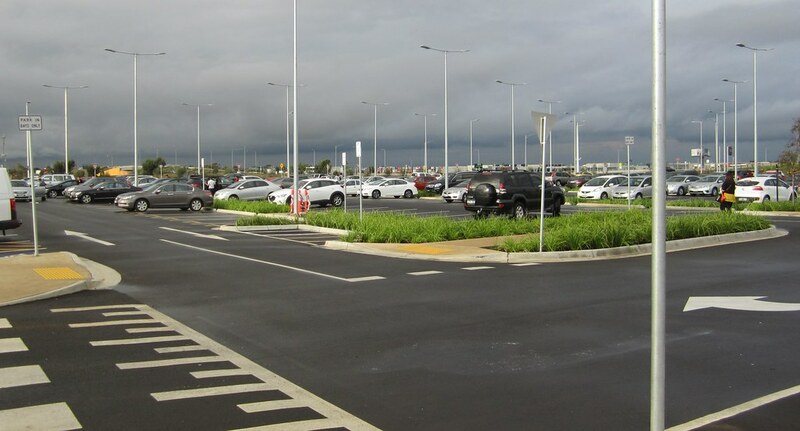 It’s good to see the pedestrian route through the carpark has been modified recently; it now heads more-or-less directly to the station entrance. I’m not sure you’d say the station looks beautiful. I guess we’ll see what it looks like when it opens. The station may look close to completion, but that is not to say that it is opening imminently. While the structure looks more and more functional every week, I’m hearing November is the likely opening date, with electrical and signalling works still underway. I suppose until the station actually opens, the extra minute or two allowed in the timetables will be one less excuse Metro has for train delays. It’ll be good to finally have it open – hopefully in time for the Christmas shopping rush. Other changes on August 27th include additional trains on a number of lines: Werribee, Craigieburn (with all peak trains now via the Loop), Sunbury (some peak trains direct via Southern Cross), and some trains extended to Eltham. There are also more V/Line services to Shepparton, Traralgon (approaching hourly on weekends, but not quite there yet), Bendigo, and Ballarat/Ararat. 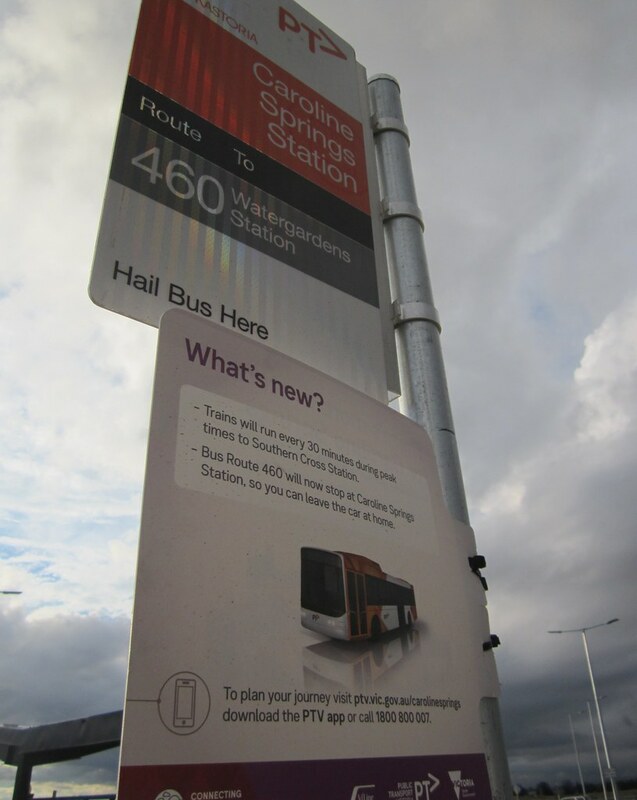 A number of local buses, both in metropolitan Melbourne and around Victoria, also have timetable changes. All in all, some good upgrades. Enough? No, of course not – missing in action is any hint of a rollout of PTV’s 10 minute suburban train plan – but this is a step forward. 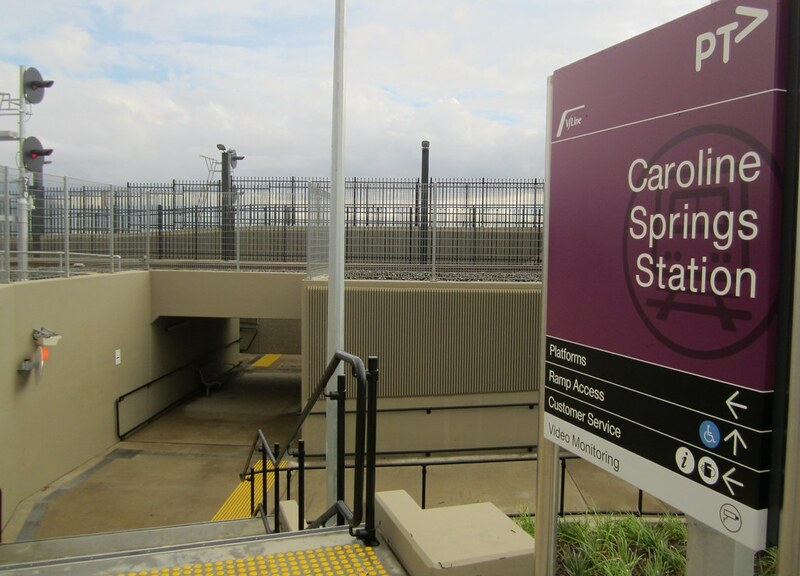 On Tuesday I headed out to the new Caroline Springs station for a look around. It opened at the end of January. I caught the 17:59 train from Southern Cross. It was heading to Bacchus Marsh, and it was full — at least by V/Line’s standards, which means every seat was taken — reflected in their official capacity figures. In fact, a dozen people were standing in my carriage by the time we left Footscray. Since the last time I’ve ridden an H-set, it appears that V/Line has fitted the seat sides with handles to help cope with standing passengers. We rolled into Caroline Springs about 5 minutes late, and the first thing you notice is that it’s in the middle of nowhere; about 800 metres from the nearest houses. This of course is a complete contrast to most of Melbourne, where suburbs developed around the railway stations, at least up until about the 1930s when the rail network stopped expanding. I touched-off with my Myki, and followed the crowd. A reasonable number of people were getting off the train here, given it’s only a half-hourly service in peak hour and the station’s only been open a couple of months. Evidently Caroline Springs Station’s working name was Ravenhall, because it turns out that’s what shows up on the Myki transaction record… they still haven’t changed it! Local MP Marlene Kairouz says it will be fixed. The other thing that changed is that the original plan for a single platform was revised in 2016, before the station opened, but after much of the station was built. It was sensibly modified to have two platforms, with a short extension to the duplicated track from Deer Park West to just past the station. Looking at the completed station, you can’t really tell it’s been modified along the way. 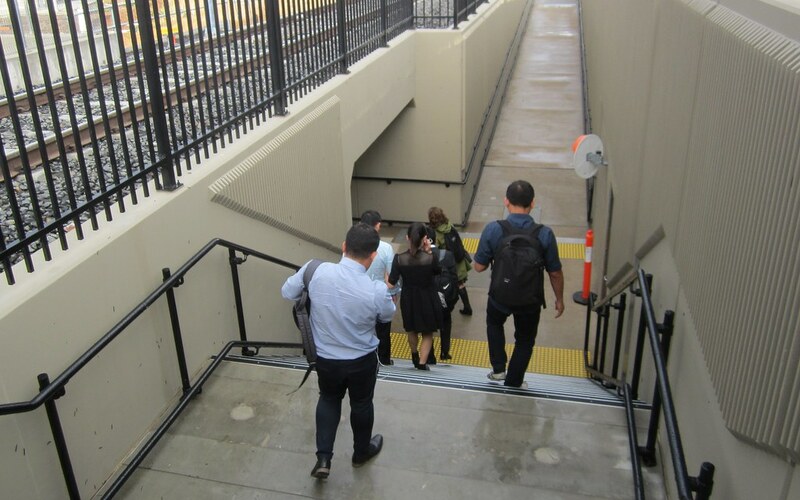 Leaving the station takes you via stairs (ramps also provided) and an underpass to the only exit to the north. 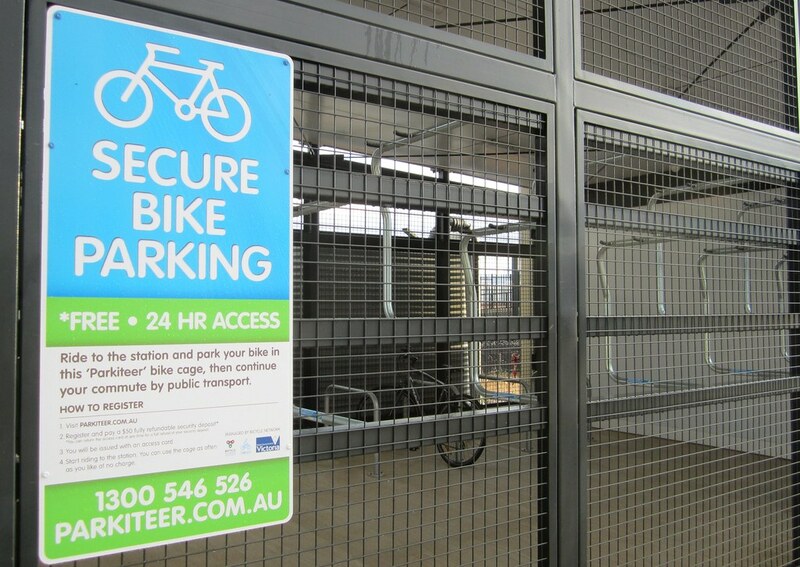 There’s a car park, a bus interchange, and a bike cage. Several bikes were in the cage, but most people walked to their cars, with a few boarding the waiting bus, which left a couple of minutes later. 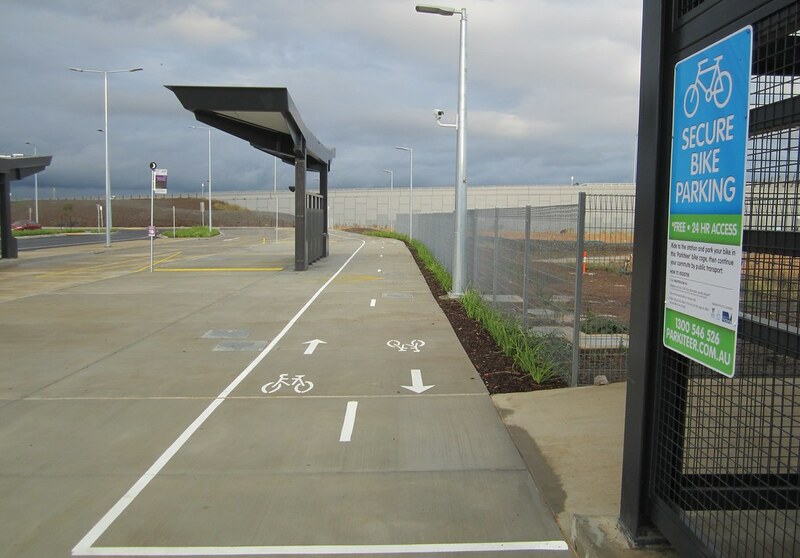 There’s a bike path that goes into the station precinct, and ends at the bike cage. I’m not sure if the road from the suburb, Christies Road, has bike lanes or if there’s any kind of separate bike path or connection to the nearby Deer Park Bypass trail. 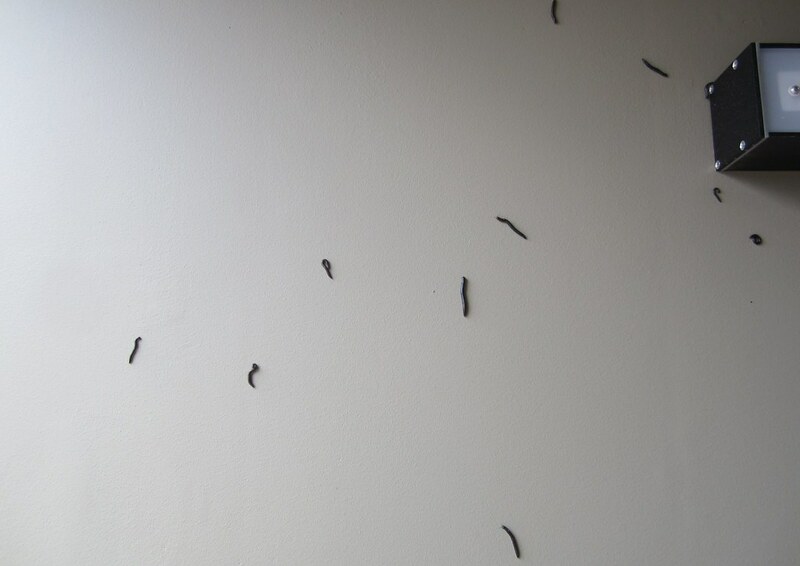 Here’s an odd thing: in the underpass was a surprising number of millipedes, mostly on the walls, some on the floor. This is not something I’ve seen before so visible in a station, but around Australia, including in Victoria, millipedes have caused train delays and even been blamed for a train crash in Western Australia. In 2012 they forced V/Line to ensure all trains were at least two carriages. I hope they’re aware of this latest occurrence. Touching-on my Myki as I re-entered the paid area, I waited for the train, and looked around the platform, taking a few more photos and trying not to look too suspicious to my vigilant friend. 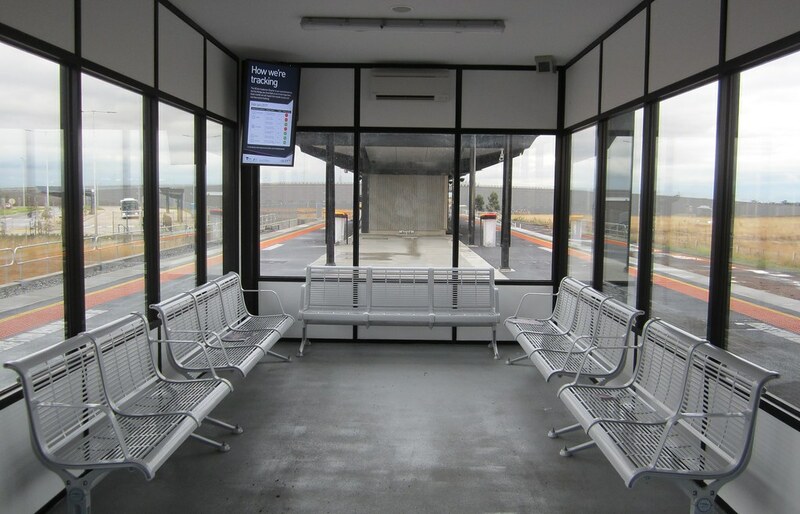 There’s a fully-enclosed waiting room with an information screen and timetable display inside. With little weather cover around the station, that’ll no doubt be useful on cold winter mornings. This next photo shows along the platform there are markers for where the different length trains should stop. You can also see the base of a future staunchion, which seems to have been installed as part of provision for electrification of the line, which is expected next decade. Good forward planning. The sign on the fence refers to the adjoining conservation zone, which probably means there will never be development immediately around the station. Looking west you can see where the double track ends, with just single track extending beyond towards Melton. 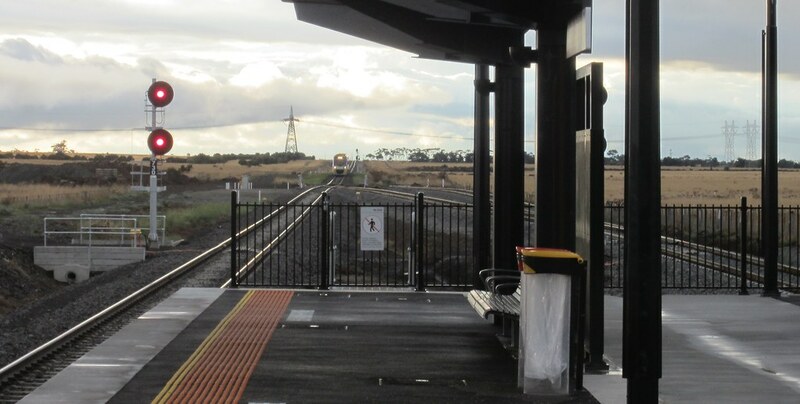 The single track is going to be duplicated as far as Melton as part of a project to upgrade the Ballarat line that was announced last year. Oddly they list “duplication of 17 kilometres of track between Deer Park West and Melton” — perhaps the already-duplicated section to Caroline Springs was technically part of the same project or something. No matter – it made sense to do it while building the new station. Single track of course plays havoc with train operations. Any little delay can very quickly snowball, as trains have to wait for each other. In this case, there should have been another train from the city to Ararat, due at 18:45. That should have entered the single track, before passing the inbound train I was waiting for at Rockbank at 18:50, which in turn would have reached me back at Caroline Spring at 18:55. But the 18:45 train to Ararat was some 26 minutes late departing the city — and may have delayed (or been further delayed by) the inbound trains following mine. It’s a precision juggling act that won’t be required to the same extent once the line is duplicated. 18:26 Southern Cross – Ararat is delayed approximately 26 minutes due to the late arrival of another service. V/Line blamed the long delay on the late arrival of another service… this was a train from Waurn Ponds on the Geelong line, which had suffered extensive delays right through that evening’s peak hour. It beats me why they run their operation like this, with delays on different lines cascading onto each other… but Metro’s not much better at times. 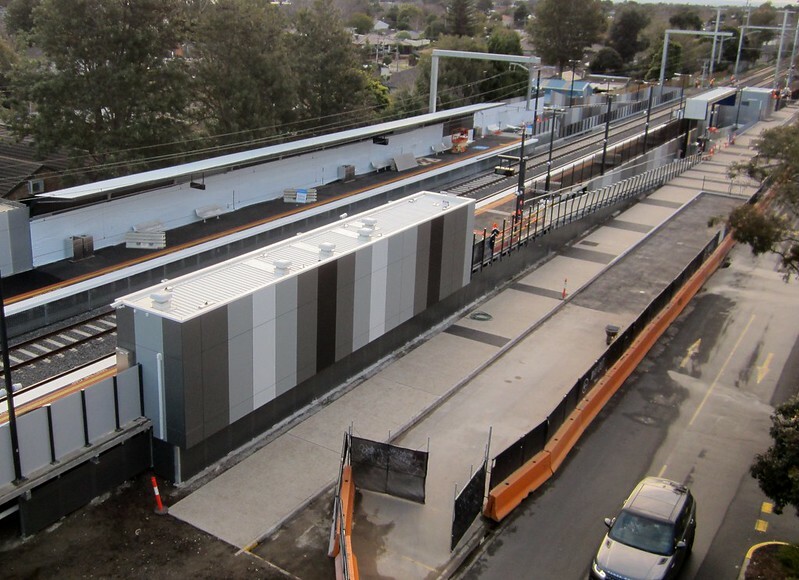 The Ballarat line upgrade project will bring a much needed boost in terms of track capacity and reliability. 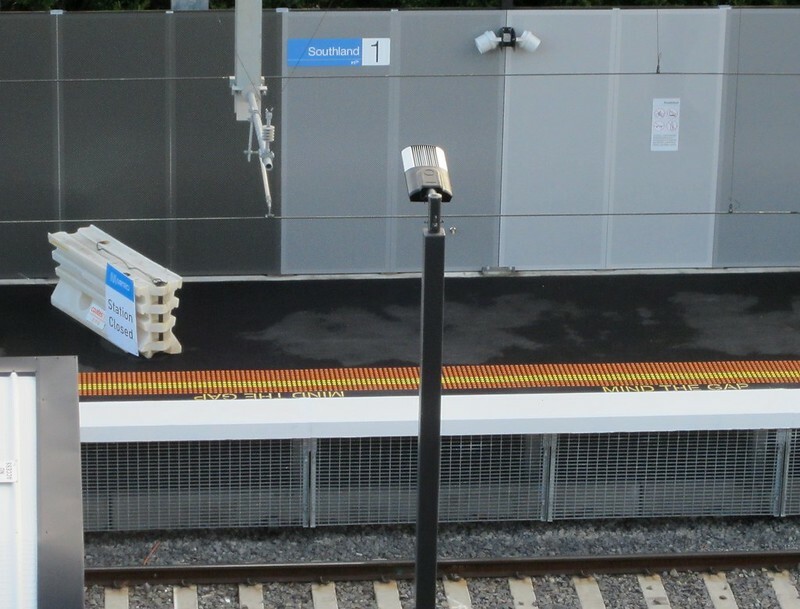 It’s good that Caroline Springs finally has its station, but further upgrades will help passengers at stations in Melbourne’s fast-growing outer suburbs, and right along the line. Provided they can keep the millipedes under control. @danielbowen I went past today, pest controller was there spraying for millipedes.